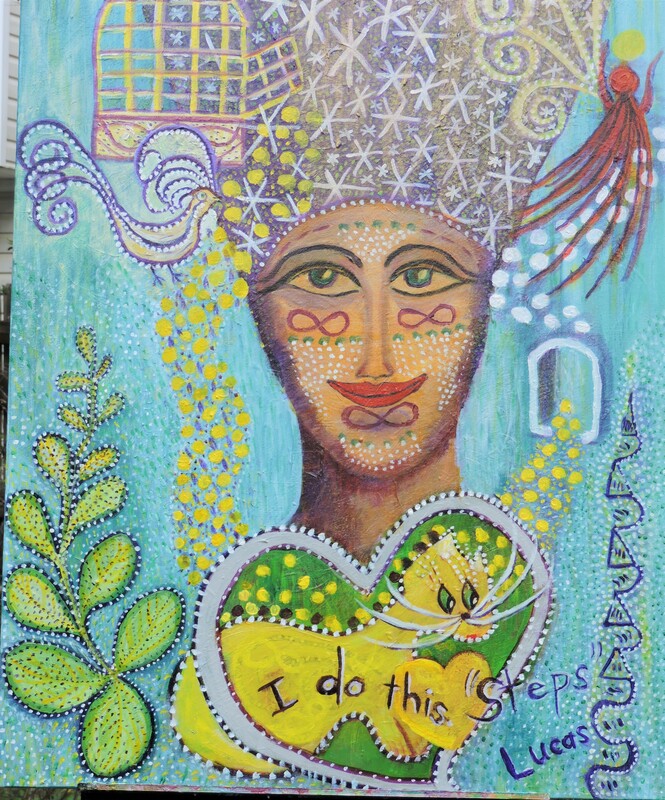 I do the work of messenger, teacher and intuitive artist. I help people gain understanding of themselves so that they can experience more of the greatness of life. My paintings of your soul colors are intuitive readings done with paint instead of words. My formal education and training comes from West Liberty State University, West Virginia University, the University of Sedona and lots of independent study with energy and spiritual healers. Most of us are familiar with the Trinity: Father, Son, Holy Ghost. Many people speak of the Trinity at this time of year. However, there is another Trinity, the Human Trinity. Many of us struggle with being sovereign and a part of the Human Collective and some piece of the Universe. It’s a lot to take in. 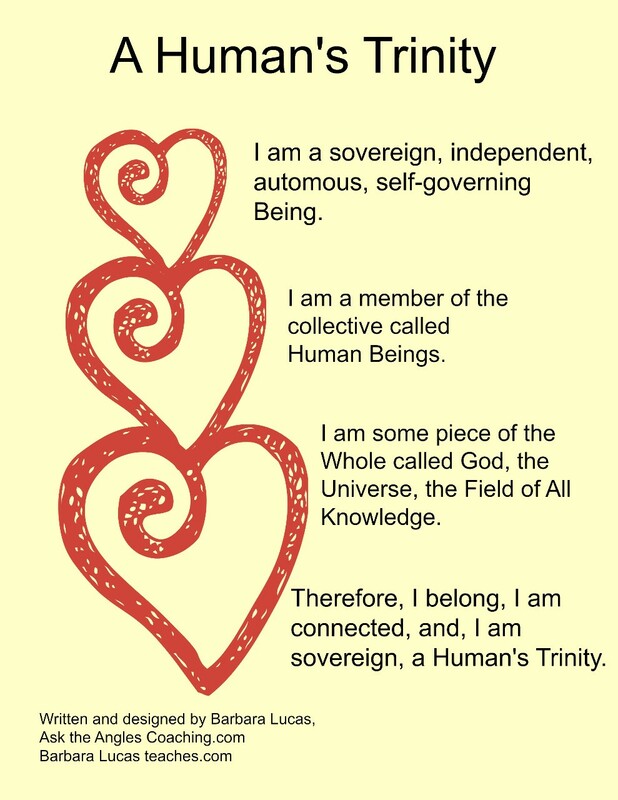 Take time to study this chart, take it in and know: each of us belongs to the collective, is some piece of God and, the most important truth of all, each of us is sovereign, independent, self-governing, and automous. Exam season is almost here. I am perfectly calm and relaxed. I have a perfect memory. I remember everything I’ve ever read. I remember everything I’ve ever heard. My mind is like Google. Answers flow into my mind. I have perfect retention, recall, comprehension and assimilation. My memory bank continuously expands. What I concentrate on expands in my mind. The answers are in my mind; the answers easily make themselves known to me. I am certain that I know the answers. I am certain that I ace every test I take. I always rank in the upper ten percent of any group to which I belong and any test I take. Thank you, my mind. Thank you for knowing that all of the above is so for me. Thank you for making this my reality. Most of you know that I teach young children via the Net as well as older folks. I teach children English. I have several students who are abusive and mean. Yes. You read right. These children are abusive and mean to me, their teacher. I suspect they, also, are bully’s to other adults and children. It is time we take a good look and admit that not all children are sweet, loving persons. Yesterday, I reached my breaking point with children who are uncooperative, who deliberately make with their mouth or hands or objects loud noises or who fiddle with their video feed so that I think something is wrong with the Net or my system. Like many of you, I know that going to a boss or manager or employer or principal or parent for help is a waste of time. When I worked in American public schools and asked for help with students who were destroying the classroom or who were bully’s, I was always told that it was the teacher’s fault or the teacher’s problem. It is time that the workers and doers of this world stopped putting up with abuse. No matter the form of the abuse. Low pay is abuse. Long hours are abuse. Being expected to work without being paid is abuse. Putting up with mean-spirited clients/customers/students/employers/co-workers is abuse. I remembered that it doesn’t matter what I feel or believe or think. What matters is what I say to my mind. What matters is the words I speak and think that my mind hears and reads. Wow! All of my students joyously and eagerly come to my classroom. They are happy to receive a lesson from me. They are relaxed and at ease because they trust me to teach them in a kind, loving, productive way. They cooperate with me. They do what I say when I tell them to do something. They willingly participate in the activities of the lesson. They know that I am an amazing, awesome teacher. They know they are privileged to be in my classroom and to be one of my students. They love, love, love me and I love, love, love them. They quickly learn the lesson. They have fun. They enjoy the activities. They willingly pay me. They pay me an amount that makes me very happy and makes me feel very wealthy. Thank you, my mind. Thank you for making this a reality in my experience. I love you, mind. I love my students. I love me. I love what I do and who I am. I love, love, love me enough to refuse to experience abuse of any kind. If you deal with the public as a worker/doer such as a hairdresser or waitress or mechanic or sales person or counselor or minister or boss or manager or worker/doer in any industry, I invite you to take what I said to my mind, make changes like changing the word student to client or customer and say these words to your mind. It is time we stopped thinking we have to take abuse. It is time we told our mind who and what our ideal student/client/customer/employer is. The words about our ideal student/client/customer/employer/co-worker/family member/friend must be said many times each day. Consult the Time Table for the Mind. Results begin to show up in 21 days or less. Permanent, long-lasting results show up in 40 days. The answer is “Mind, our personal mind and the Great Mind, gives us what it thinks we want.” It listens to what we say and think; it sees what we see; it determines what we want from these actions. Mind then proceeded to make certain you got what you wanted: making it on your own. No government assistance. No family help. No friend help. No corporate help. Yes. You feel ignored because you are ignored. After all, you said and thought that everyone should pull themselves up by their boot straps. Mind gave you what it believed you wanted. So. Why are you complaining? Why are you saying no one helps you? Why are you feeling ignored by politicians? Oh. I get it. By everyone, you meant those people, those people over there. Not you. You, of course, wanted help; everyone else should pull themselves up; get what they want without help. All of us know that no one makes it on their own. All of us need, want and, if we are smart, accept and give help. “Everyone has boots and straps that are strong, flexible and able to bear weight. Everyone has the exact pair of boots and straps required for rising up and expanding in the directions of their choice. Everyone, including me, gets support, encouragement and help. Everyone, including me, is supportive, encouraging and helpful. I don’t make it on my own. I make it with help from all people everywhere. I give help to all people everywhere. Mind, I open to receive help; I open to give help. I receive help for all my projects. I receive help from politicians, the government, corporations, friends and family. I rejoice when I receive help. I rejoice when others receive help. I painted this painting “Steps” to celebrate International Women’s Day: The steps of leaving one’s cage, following the path through the heart, through the doorway of life, into the embrace of Spirit. So. The mind learns by repeating. It repeats what you give it to repeat. For example, if you say many times a day or think many times a day “I am sick” you are teaching your mind that you are sick. It will create what you say. “I am sick” becomes a reality. So. Repeat what you want “I am well. I practice wellness.” Repeat it, think it often. Consider the time table I explained a couple of blogs ago and repeat, repeat, repeat. Want money? Then say, repeat and think: “I have the amount of money that makes me happy and whole.” Often. Often. Often. Don’t get upset with people and situations because both are powerless without your reaction. Wow! Another reminder that we are more powerful than we have been allowed to know. Don’t let the unwanted in.